The 46 political parties set to contest the 2019 national and provincial elections have vowed to uphold the Independent Electoral Commission's (IEC) Code of Conduct while campaigning in the run up to the 8 May polls. Party leaders today took turns pledging to respect the code of conduct during an event at the Gallagher Estate in Midrand. Addressing delegates, IEC chairperson Glen Mashinini said the assurance of a free and fair election was the responsibility of every South African and not just the IEC. "It is everybody's business. It is our responsibility as citizens of this country. It is the responsibility of the leaders of this country. The rules are straightforward, they derive from the electoral act... electoral conduct is firmly rooted in the founding provisions of our constitution," he said. He added that the code of conduct was in place to promote conditions that are conducive to free and fair elections, characterised by tolerance among political parties. The rules of the conduct, among others, requires that parties speak against political violence and threats against other parties, the IEC members and members of the public and the media. It also requires that parties alert authorities of planned marches and rallies. They are also expected to accept election results or challenge them in court. The code prohibits the use of language that provokes violence, intimidation of candidates or voters. It also prohibits the publishing of false information about other parties and their candidates. The plagiarising of party symbols, name or acronym as well as the destroying, defacing or removal of posters of other parties is also not allowed. President Cyril Ramaphosa, in his capacity as African National Congress (ANC) leader, said the party was committed to upholding and promoting the code of conduct. "We are bound, as we are gathered, by responsibility that the will of the people shall prevail by appending our signatures," he said. By this, the President said the ANC was affirming its commitment to work with all political parties and South Africans to build a strong and durable democracy. Cope leader Mouisoa Lekota said the party was signing the Code of Conduct in order to endorse its support for South Africa's democracy. "We do it so we can inspire our voters. Also to sustain that which we achieved in 1994. We also sign so that future generations may look to this moment and continue to follow those who founded this democracy," he said. During the ceremony, IEC Chief Electoral Officer Sy Mamabolo revealed that the election will see 49 political parties contest the election. "We are a third of the way into the election timetable and just 49 days remain before South Africans vote in our country's sixth national and provincial democratic elections," he said. Mamabolo revealed that the voters' roll, containing 26 756 898 voters, has been certified and the final roll published. "It contains 26 756 898 voters of whom 55 percent are women and 45 percent are men. This voters' roll represents 74.6 of the total voting age population. Since the first universal voters roll was compiled in 1999, the roll has grown by 47 percent," the CEO said. Young voters under the age of 29 constitute 20 percent of the total voters' roll, he said. "The 22 924 voting stations which will host voting and counting on 8 May have been secured and published - along with the routes and stopping times for our 32 mobile stations," he added. The 29 334 registered to vote South Africans living abroad will cast their ballots on 27 April in the country's 121 foreign missions around the world. "This is a 10 percent increase over the 26 716 permitted to vote abroad in 2014," he said. During the event, the IEC conducted a draw to determine the sequential configuration of parties on the national and provincial ballot papers. The CEO said logistical preparations for the elections are well advanced and on track. 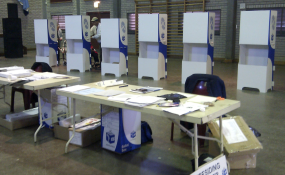 Following today's ballot paper draw, the IEC said it is ready to commence the ballot production process. "In tandem with the number of registered voters and applying universally accepted buffer threshold, we will be printing over 50 million ballot papers using over 40 tons of paper. The ballot production process will take about 14 days to complete," he said.